After Hurricane Irma passed through town, it took weeks for the water to drain away. I spent a lot of time wading through more than my share of puddles (small lakes, really). So when I started to drywall my garage, the first thing I thought about was how to keep out moisture. There are several concrete waterproofing paints that you can use, but I chose Drylok Extreme. Why do you need to waterproof your garage? Most of the homes built in the last 30-40 years have a concrete block foundation. It’s strong. It’s stable. It’s inexpensive to produce and use. When the rains come, and in Florida that happens just about every day, the wind slams the rain against your house, seeping in anywhere it can. 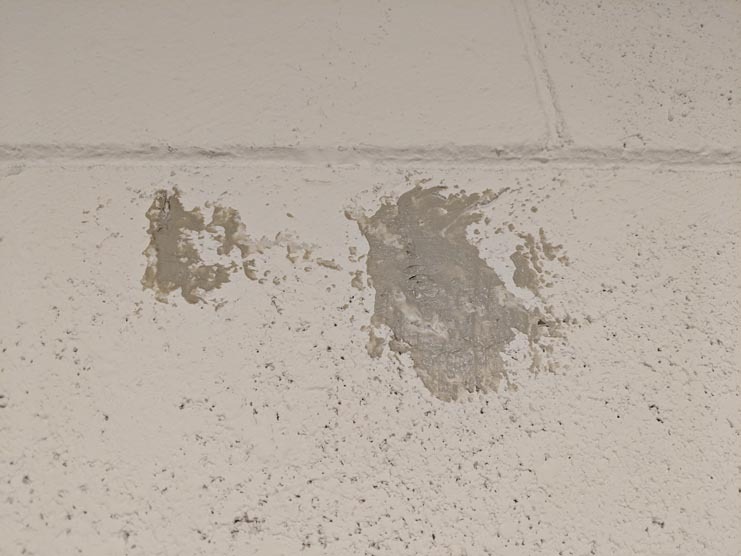 Once that water is in your walls or foundation, it can cause damage or act as a breeding ground for toxic mold and mildew. The less water that can seep into your foundation, the less chance of that happening. 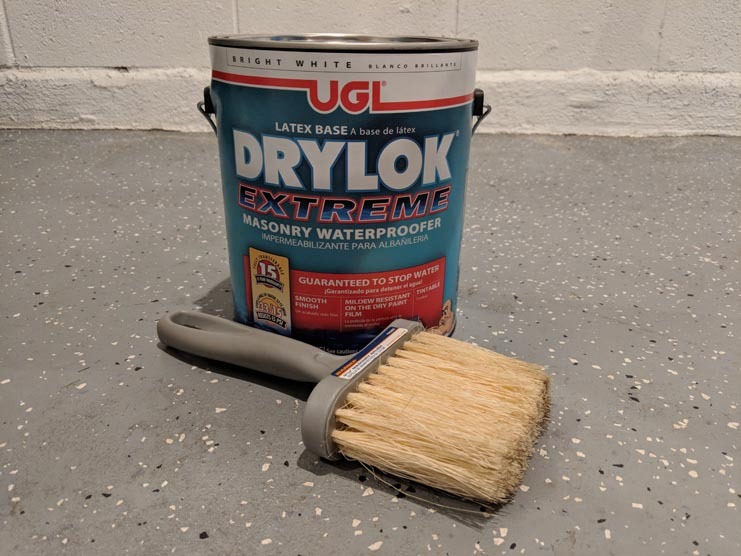 What is Drylok and what does it do? Drylok is a latex based masonry waterproofer that goes on like a paint. The consistency is something between a latex paint and maple syrup and it acts as both a primer and a finishing coat. That means you can use Drylok as a one-stop shop for painting and waterproofing. It’s available in a handful of colors, but you can always add a finishing coat of any latex paint over top of it. Since my next step is adding insulation and drywall, I’m not too concerned about the color. The walls should be clean and dry to the touch before you start applying it. Drylok will adhere to latex or oil-based paints, but it won’t waterproof the concrete. You can technically tint Drylok, but it’s not recommended. I think it’s better to use the Drylok as a white base-coat and put a finishing coat of whatever color you want. Two coats of Drylok are needed to qualify for warranty protection. And speaking of the warranty…it’s good for 18 years. For the record, that’s longer than most people stay in the same house. This part is easy, if pretty time consuming. I’m going to assume that your walls don’t have paint on them already. Remember, if your walls already have a latex or oil-based paint, which covers most paints btw, then you’re going to need to remove that first. Assuming you’re covering bare walls, you’re going to want to thoroughly clean every surface you’re going to paint. 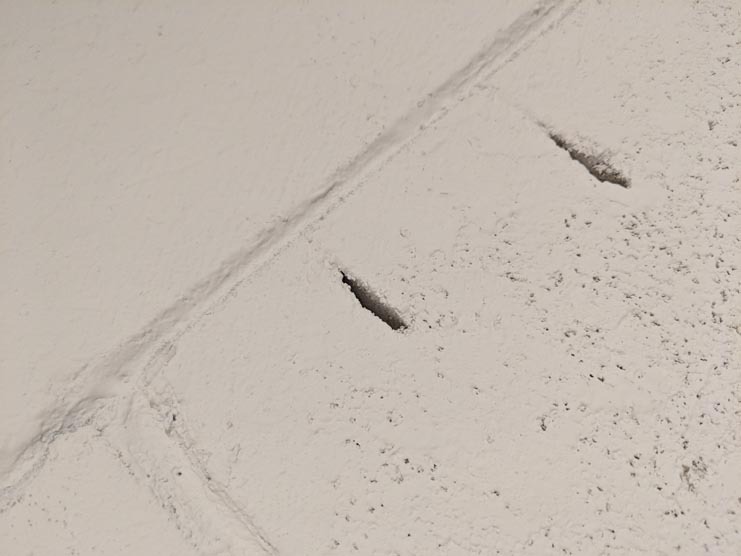 Depending on the age of your house, you may have white streaks on your concrete, called efflorescence. This is when salts and minerals in the water coat and discolor the concrete. You’ll definitely want to clean that off first because Drylok will have a tough time adhering to that coating. One of the more aggressive cleaners you can use on concrete is muriatic acid. I recommend this only as a last resort. Unless your walls are heavily stained, more mild cleaning agent should do the trick. Here’s where I messed up, so don’t do what I did. After I cleaned my walls and got rid of all the dust, dirt and spiderwebs, I immediately put on the first coat of Drylok. What I should have done was do a better job of inspecting for any cracks or holes that needed to be filled at the beginning. Drylok normally takes a few hours to dry fully, so if you want to get everything done in a single day you can. I spread the project out over two weekends because I had other things that I was working on as well. To be honest, I’d rather do just about anything instead of paint, so I was definitely procrastinating. After that first coat (during it, if I’m being honest) I noticed several holes in my wall and a couple of hairline cracks. As good as Drylok is, anything larger than an Aspirin pill should really be filled first. 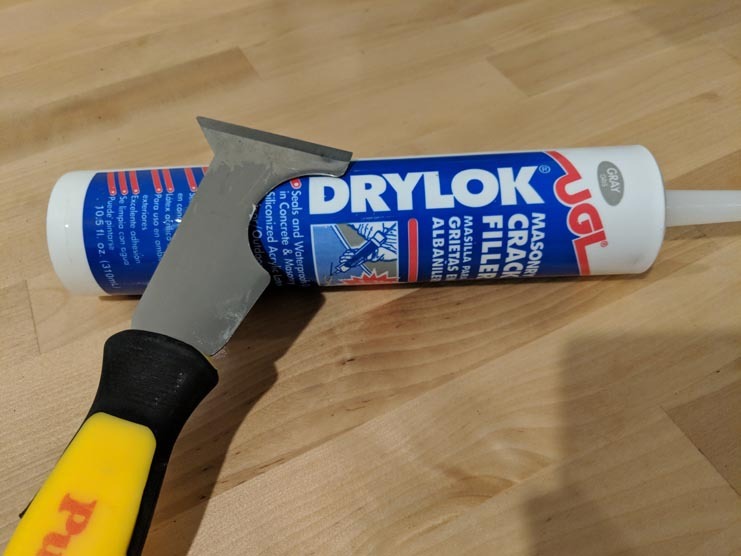 Instead of compounding the problem and going straight into the second coat, I picked up a tube of Drylok Masonry Crack Filler (link to Amazon). Let me be clear on something: Any masonry crack filler will do here. I stuck with Drylok, but you certainly don’t have to. There are a ton of options at your local Lowe’s or Home Depot. As long as it’s designed for use on concrete block, they’re all pretty much the same. All you need to do is squeeze the masonry crack filler into the holes and trim off any excess. If the hole is more than a centimeter deep, you’ll want to fill the crack in stages and let it dry in between. If you’re going for a smooth finish, you’ll want to use sandpaper to take off some of the excess. I skipped this step since I was going to put frame and drywall on top. of it. The important thing I want you to take away from this is to fill the cracks FIRST – before you start painting. Got it. Good. Let’s move on. If you like painting, you’ll love this part. Me? Not so much. 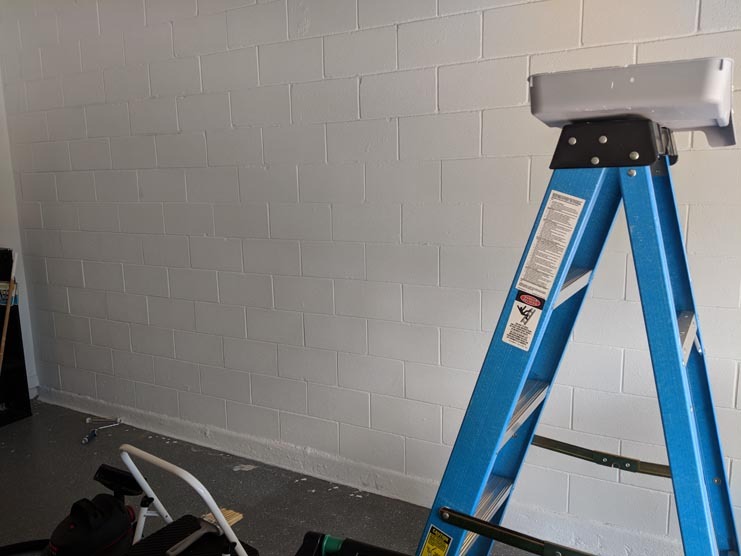 There’s two parts to painting a wall – the edges and that big empty space in the middle. You can get a small roller for the edges, but I don’t really trust myself not to make a huge mess, so I prefer a brush. Masonry brush: These brushes have heavier-duty brushes that are coarser than normal paintbrushes. The concrete wall is so rough that it will rip a normal paintbrush to shreds before you even finish the trim. 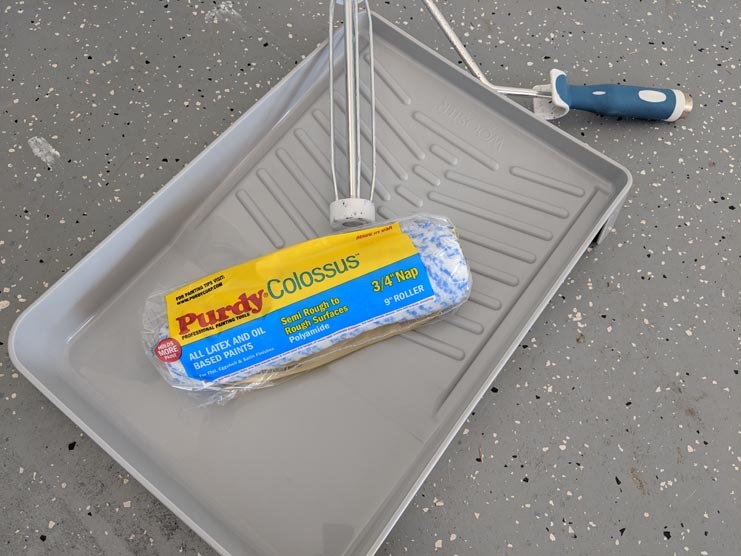 Paint roller: Opt for a roller with at least a 3/4 inch nap on it. This will let it soak up enough of the paint and spread it evenly over the rough surface. The type of paint tray isn’t important. If you want, you can usually get by with a spare you’ve got left over from another paint job. Just be sure that any old paint is thoroughly cleaned off first. I ended up buying a new one because they’re less than $5 each and usually you can find them at your local hardware store for under $2 each. As I said before, Drylok goes on fairly thick and exactly like you’d paint any other surface. One gallon covers anywhere between 75-100 square feet. So for two coats of paint, I used about a gallon and a half of Drylok for one wall in my garage. At $30 a gallon it’s not cheap, but it’s a lot cheaper than fixing water damage from leaky walls. Even if you’re not going to put a finishing coat of paint to change the color, using Drylok to waterproof your garage walls freshens up the look and (more importantly) stops any water from leaking in from the outside. The next step in my garage transformation was to add a wood frame over the concrete garage walls. Click on that link to follow along.